Traditionally, marketing communications (talking) and market research (listening) have been separate functions within an organisation. This has always made sense, with both requiring different skills and adopting different strategies. However, it’s a structure built for an analogue age, and it needs to evolve if organisations are to keep up in an increasingly competitive landscape. Now it has got to a point where certain organisations are evolving faster than others. They recognise that engaging their best customers in two-way dialogue – bringing talking and listening together – yields significant advantages. Social channels are one part of this conversation, while insight communities are another. Insight communities facilitate conversations between brands and customers. In an insight community, hundreds or thousands of customers are invited by the brand to join and take part in two or three activities each month. These activities provide insight into their needs, help create new products and services or improve brand communications. With deeper understanding comes more opportunity for success. For Exterion Media, formerly known as CBS Outdoor UK, gaining regular insight from its consumers has helped drive sales in very tangible ways. 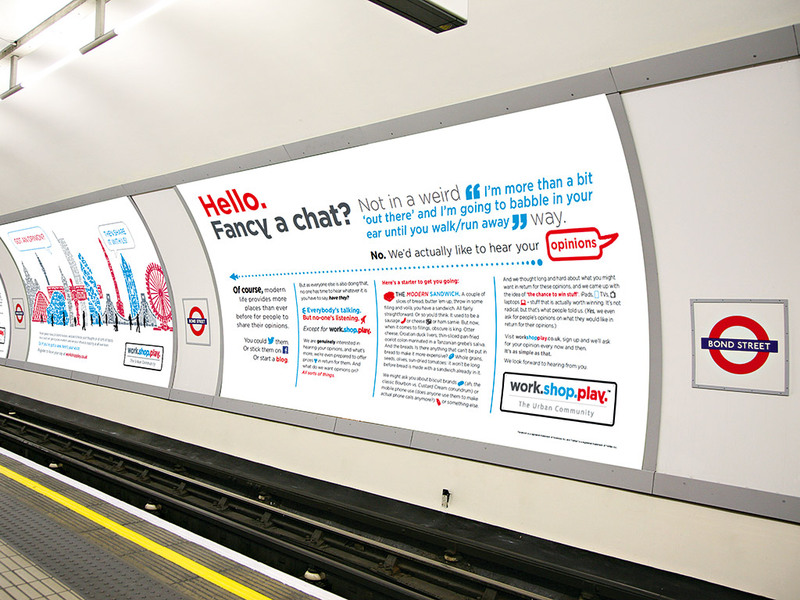 In 2012, the out-of-home advertiser launched ‘work.shop.play’, its proprietary insight community of nearly 10,000 urbanites. Ongoing conversations with the urban audience – people who consume the adverts on Exterion’s inventory on a regular basis – have transformed the way the company does business. Insights from work.shop.play have been fundamental to developing the sales strategy within the organisation and are now integral to the sales team’s success at Exterion. Quality insights help support the sales process and many media planners, allowing the buyers to make creative and logistical decisions using insights gained from the community. A range of high-impact, dynamic deliverables including infographics, category booklets and interactive research dashboards help prompt conversations. It also gives the sales teams the ability to advise clients in creative advertising approaches, as well as placement and format. The community has also supported better collaboration and partnerships with media planning and buying agencies. Insights from work.shop.play are used to engage customers throughout a much more consultative sales process, and have had a significant impact on clients’ outdoor creative strategies. This has included the high-value car advertising market, where sales teams were able to leverage automotive insights from work.shop.play to educate clients and help them tailor messaging to the specific needs of the urban audience. Similarly, a piece of research on the financial services industry – presented to a media planning and buying agency – directly influenced their entire planning cycle ahead of schedule. The creative strategy was amended as a result, and then launched right across Exterion’s inventory. The research team and its insight community have played a fundamental role in building a new audience-focused brand positioning for the company. In general terms, audience understanding continues to be difficult for most outdoor advertising providers. At Exterion, audience understanding used to come from biannual deep dive research studies, where insights were quickly out of date. Prior to launching the community, the Exterion Media proposition, as with many outdoor advertising providers, was focused on the functionality of advertising panels: dwell times in the underground, maximum reach and coverage, and the frequency of buses around the country. Sales pitches rarely touched on the audience that advertisers were trying to reach. Work.shop.play has transformed Exterion’s brand strategy, focusing on the consumers of advertising and the urban audience, rather than the tangible aspects of the inventory. The new system has been integral to improving brand perceptions and changing the attitudes of two key stakeholders. As a result of its insight community, Exterion has seen a significant shift in customer (advertiser and media agency) perceptions and a subtle change in audience perceptions (those who view advertising on Exterion’s inventory). Among customers, Exterion is now perceived as an insight-led media partner. Customers have much more trust in the brand, as no other outdoor agency currently provides comparable levels of audience insight. Advertisers and their media agencies now book with Exterion on the strength of their audience understanding and the creative impact this can bring – not simply because of the scale and reach of their inventory. Audience perceptions have also been impacted by work.shop.play. Community members now have a much more positive sense of how engaging and rewarding the research process can be; they have a more favourable brand perception of Exterion Media; and they are more engaged in outdoor advertising. Community members have also tweeted extensively about it using #workshopplay, and work.shop.play was even awarded website of the day by Pocket-lint. Work.shop.play generates audience understanding that no other outdoor media company currently offers. This has given Exterion a significant competitive advantage and acts as a key point of differentiation in an increasingly competitive advertising market, particularly against new data-rich players such as Google, Facebook and Twitter. Furthermore, the community has delivered a regular stream of insights to inform advertisers about the constantly evolving urban audience – what they are thinking, feeling, and doing on a daily basis. Importantly, this is not about the advertising they see, but what really motivates them as they make the choices in their everyday lives. These insights give the Exterion sales team and its clients a deeper and more relevant understanding both of target consumers and broader categories to drive creative development and media strategy. The work.shop.play community has also helped the Exterion sales team increase revenue streams. In 2013, the company beat its annual revenue targets for the first time in several years and achieved growth higher than the rest of the outdoor media market in the final quarter of 2013. The community was also responsible for helping generating £2.8m in net revenue in the finance category alone. The insight community has been fundamental to the success of Exterion. It has given the company a competitive advantage and a point of differentiation in a challenging market, and has in turn significantly increased revenue. Having real dialogue with the urban audience brings enormous benefits to business.